With the advent of IoT and BlockChain driving the business in today’s digital world, let me put forth my thoughts on how these technologies and platforms would enhance the business values and pave way for new business models. Modern vehicles are not just vehicles they are SMART Vehicles. Smart Vehicles are fitted with various sensors and gateways that propagate almost each and every movement and changes in the vehicle as well as the driving behavior. This has resulted in various use cases like Driving behavior analysis, Value depreciation forecast, Driving pattern based incentive/insurance etc. Due to the fact that Smart vehicles are sending numerous data points, it is easier to track and trace the fleet of vehicles and even control them with Alerts, notifications and instructions. This also paves way for a connected logistics where all the stakeholders are connected and are able to get real time information on the complete logistics movement. We are now in the era of Digital supply chain that gives lot of advantages in terms of processes and cost aspect. 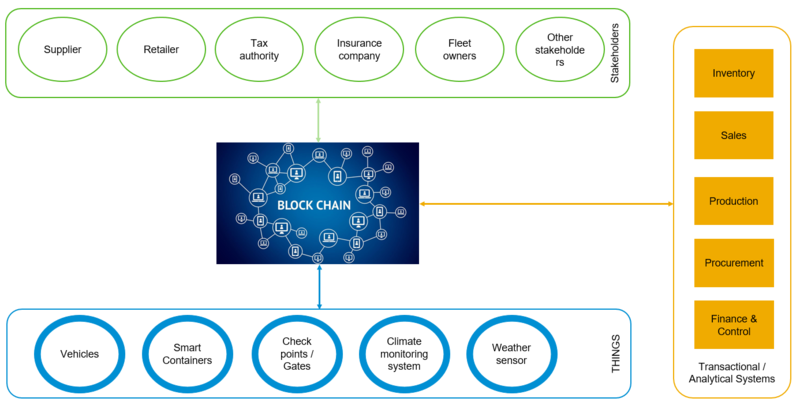 There are numerous digital entities that are involved in the Supply chain space including Payment gateways, Fleet tracking systems, IoT enabled cargo, smart vehicles, vehicle gateways, Business systems(like SAP ERP),etc. These are interconnected and has to work hand in hand. When one or more entities or THINGS fail or hacked, then the entire chain gets impacted resulting in business impacts. Also the financial transactions are passed via multiple business systems, payment gatewways etc. which delays the processes as it requires multiple checks and verifications before acknowledging the payee to proceed further. Block chain is a digital, distributed, secure and reliable ledger that stores digital transactions. Maintain any legal/confidential documents (tamper proof) related to stocks, tax, inventory, sales, etc. End to end transactions including the thing data are recorded in Blockchain providing flexibility to access transaction history at a particular point in time. Do you know when SAP will implement Blockchain onto all their transactions? I believe SAP Ariba are adding blockchain to their transactions. Will this happen at a transaction level? So for every transaction between a company and its supplier or debtors will it be reflected in a node in blockchain? I am trying to picture how this may happen for a large company. For example will all my purchase orders (POs) and the related invoices and payments of these invoices for a particular supplier go into a private node in the blockchain. Where only the 2 parties involved (ie the company and this supplier) can see this transaction. And maybe some other related stakeholders. I have subscribed for BaaS in SAP cloud platform. As of now I can able to deploy and execute only single go file application. But my application containing more than 3 go file so how do I deploy & execute this.